Welcome to the 14th edition of my (normally fortnightly) BullCharts software Tip Sheets, focussing on tips and hints regarding the Australian BullCharts charting software package. Sometimes we get carried away with priorities, and some things just slip a little; but this edition of the BullCharts Tip Sheet contains some really juicy details about both Bear Markets turning, and Multiple Moving Average (MMA) indicators. In the notes below, we copy an existing indicator, and customise it to create our own. I have already done this. If you want, you can download my own MMA indicator, and use it without going through the steps below. A link to do it, plus download instructions, is included below. Please note that I am re-running a seminar from last year - Technical Analysis Introduction. It's happening in late June!! More details in the column at right. Firstly, a little good news about some BullCharts hands-on workshops that I have been talking about for a long, long time. As I mentioned last time I have sourced a good venue in Vermont South, just off Burwood Highway, not far from the Vermont South shopping centre (in Melbourne's eastern suburbs). I will be running a whole series of share market and technical analysis seminars and BullCharts workshops at the Vermont South Community House (VSCH) in the school term 3 from July to September. The VSCH is publishing and distributing over 4000 copies of their total education program to neighbouring houses. If you live in that area you will receive their program and see the event details. I will very soon put the details and dates on my web site here - stay tuned. I recently delivered my new and FREE seminar - "The 10 Key Lessons from the GFC (for investors and traders)" seminar (ie. the Global Financial Crisis) at The Leighoak Hotel in Oakleigh. There were free hand-outs for all those who registered. A copy of the 25-page handout notes is available to download for FREE from this web page. I am always happy to receive feedback and suggestions for these Tip Sheets. Or if anything in a Tip Sheet is not clear, please feel free to contact me to ask about it (by email or phone). Or maybe I have made a mistake, which I will be pleased to correct in the next Tip Sheet (along with an acknowledgement for whoever spots it first). Have a look at the Price Chart shown here of the XJO (S&P/ASX 200) since late February, and showing the last market bottom on 6 March. 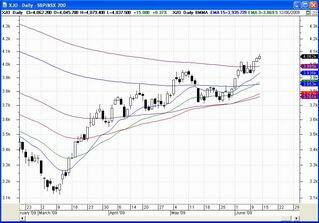 The highest curve on this chart is a 200-day EMA. (You can click on the chart to see a larger version.) Notice that the price is now moving above the 200 day EMA. It can be possible to get a feel for the bullishness of the market by looking at share prices compared to their longer-term MA (on price charts like this one). Some people use this observation (ie. price above long term MA) as a buy signal. And of course they look for confirmation from volume, or another indicator or a chart pattern. But which long term MA should we look at? Above I said that some people say that 200 days is significant. But other commentators and analysts suggest different time periods. For example, Stan Weinstein in his book "Secrets for Profiting in Bull and Bear Markets" talks about a 30-week MA. He says that we should not buy a stock if the price is below the 30-week MA. And in the AFR newspaper (Australian Financial Review), they publish charts using a 60-day MA in the Market Wrap section where they show charts for five stocks on one page, and several overseas indices on another page. And you will find other experts who have a similarly different opinion about which time period is best to use. To help us work out which of these might be best for us, we can use a Multiple Moving Average (MMA) with some key time periods, all on one chart. It could be useful to view a Daily chart and show a 200-day MA, and a 150-day MA (which is very close to Weinstein's 30-week MA), plus maybe a 90 day MA, and a 60 day MA. If you are happy to have as many as 12 MA curves on your chart, then you can use the "Guppy Custom MA" in BullCharts, and enter your own time periods. You can customise it and save your preferred values as the Default values. To find this indicator in BullCharts, choose "Insert Indicator" from the menu (or Ctrl+I). In the Indicator dialogue box, in the "Category" drop-down, scroll all the way down the list until you find "Guppy, Daryl" toward the bottom (this drop-down groups the indicators, with authors towards the bottom). Then when Daryl Guppy's indicators are displayed, choose "Guppy Custom MA". On the right hand side of this dialogue box you can enter you own values. However, if you don't want 12 MA curves, you can create your own indicator, and add it to your Indicator toolbar. This is explained in the next section. If you want to create your own indicator, there are two ways to do it. If you know enough about how to do it, you can "create a new" one from scratch. But it is easier to copy an existing one, and then modify it. In the text below, we will copy an existing one and modify it to suit our own purpose. 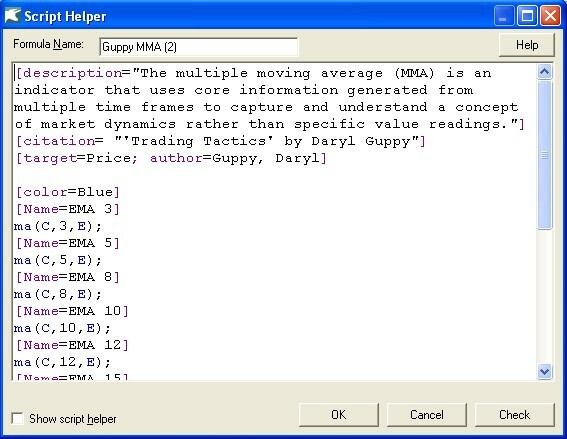 I want to create a variation of the "Guppy MMA" indicator, so we will copy this one as our starting point. In BullCharts, create a new chart (eg. XJO). Click on the menu item "Insert > Indicator" (or use Ctrl+I). In the "Category" drop-down selection, scroll down to "Guppy, Daryl" towards the bottom of the list and click once on it. 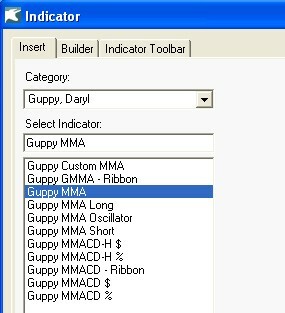 In the "Select Indicator" section, click once on the "Guppy MMA" item in the list. Note that there are no optional parameters available for customisation on the right hand side. Note there are 3 tabs near the top of this dialogue - Insert, Builder, and Indicator Toolbar. Click once on the "Builder" tab. Click once on the "Copy..." button. In the next dialogue box ("Script Helper" is displayed across the top), click once in the "Formula Name" field near the top, and replace the text that is there with your own name - eg. Brainy's MMA. Then click on the OK button. As soon as you do this, BullCharts will create a new disk file on your computer in the folder described below, with the name that you typed into the "Formula Name" box. Note that it appears under the heading of "Guppy, Daryl" along with his other indicators. The Script Helper dialogue box is explained a little more in the following section. In the section above we copied an existing indicator, so now let's Edit this indicator, and customise it to use our own time periods. Follow these steps. In the "Indicator" dialogue box that shows you a list of the indicators, find the one you just created, and click on it once to select it, then click on the "Edit..." button. In the "Script Helper" dialogue box (see above) note the first paragraph of text starts out with "[description]=...". You can change any of the text here to anything you like. Notice the text a few lines further down: "[target=Price; author=Guppy, Daryl]". You can change any of this. You should replace Guppy's name with your own, so that the indicator will later appear correctly in the list of indicators. [color=Blue] - This specifies the colour to be used for the next chart item. There are many valid colours that you can specify here (about 120). To see a list in BullCharts hit the F1 key for help, then in the Search field type in the two words "color attribute" (without the quotes) and hit Enter, and select Color Attribute from the resulting list. [Name=EMA 3] - This specifies the name of the next chart item. In this case, we have called it "EMA 3". You can change this to "fast", or whatever text you like. Once again, to learn more, use the BullCharts help topics. 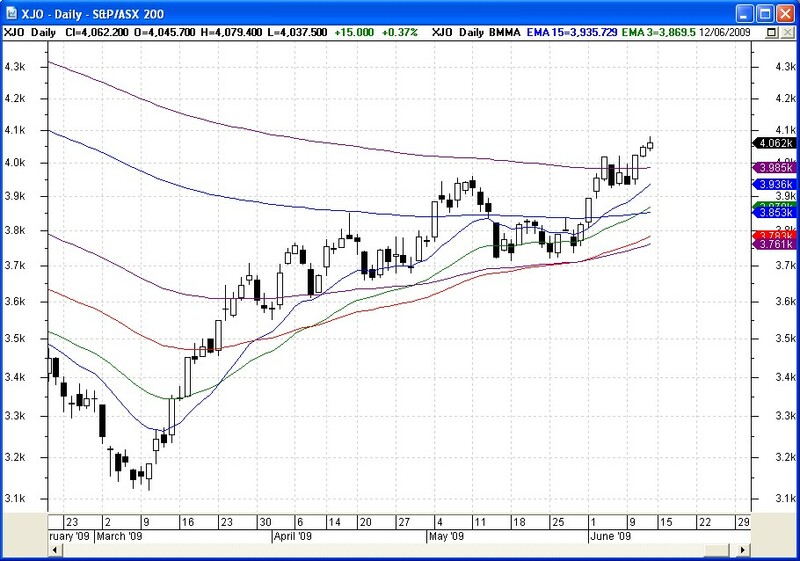 ma(C,3,E) - This specifies that a Moving Average is to be plotted on the chart. The letter C of course is for a MA on the Close prices (you can change this to: O, H, L, etc.) The 3 is the number of bars. The E indicates the "method" to use - Exponential, Simple, Weighted, etc. (see the BullCharts help for a list of possibilities). Now that you know the above, you can change any of the text in the indicator, and click on the "OK" button when done. 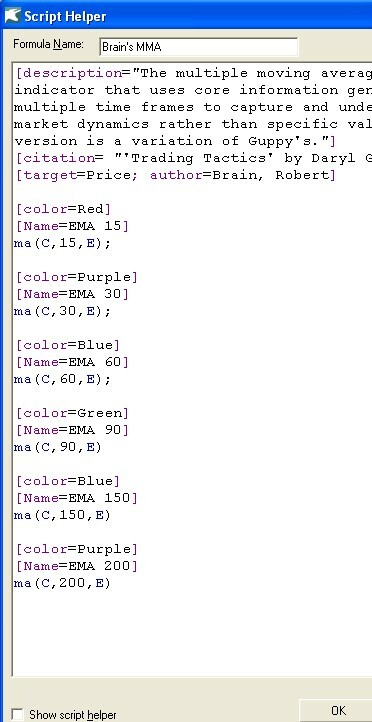 I have already done a sample version (called Brainy's MMA) and it is shown below. It is easy to download someone else's BullCharts scan definition file, or custom indicator, and use it on another computer. This is because each indicator is stored on your computer's hard drive as a separate and unique file, and the file name is the same as the name you give to the indicator. You can email the file to someone, or download from a web site. The steps to download this one from the web are explained here. Very briefly what we are doing is this: Copy the indicator file to the correct folder on your computer, then start BullCharts. It is that easy. When BullCharts starts, it checks all the custom folders / directories and notes what files are stored there. Firstly, if BullCharts is running, then shut it down. Right-click on the link below, and select "Save Link As..."
Now start BullCharts and it will be listed with other indicators. Download Brainy's MMA BullCharts indicator here. At the 4-hour Technical Analysis Introduction seminar I am running in late June, I will give you a really good broad understanding of what Technical Analysis is all about. You can register at my secure outsourced OnLine Shop with credit card or PayPal, or print the registration form and send it in the mail (but if sending by mail, please ring me first to reserve a seat). The seminar venue on this occasion is the Leighoak Hotel in Oakleigh.